Please browse our website via the links above to discover more about us, our activities and our wonderful twin town friends and experiences. 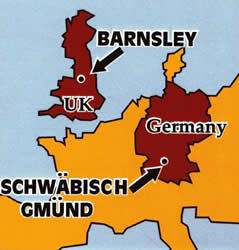 Links have existed between Barnsley and the Baden-Württemberg town of Schwäbisch Gmünd since 1954. It is interesting to note that initial links which led to the friendship and twinning was started by young people primarily through youth exchanges in the early days. On June 24th 1971, the two towns were formally twinned, supported by both Local authorities, their Officers, Mayors, Burgermeisters and Oberburgermeisters in an official twinning ceremony and document. Since then regular visits by council officials has taken place in both directions but it was felt that twinning should also involve ordinary towns-people and on March 28th 1978 the inaugural meeting of what was to become the Barnsley Schwäbisch Gmünd Twin Town Society was held. Countless Barnsley people have to date, visited the historic Baden-Württemberg twin town, marvelled at the scenic beauty, fascinating architecture and experienced the warm hospitality of the townfolk. It is hoped that browsing this website will encourage you to get involved, get in touch, sample an event or two and become a member of the Barnsley Schwäbisch Gmünd Twin Town Society.